1925 – Born in the village of Racacun, Romania. At the age of 5 moved to Bucharest. 1938 – Taken by the Romanian Iron Guard during the pogroms before the Germans invaded Romania. 1940-1944 – Forced Labor during the Holocaust, many times painting saves his life. Takes part in the Gordonia Underground. 1944 – Escapes Forced Labor, receives a certificate and boards an immigrants boat. Experiences the trauma of the sinking of the "Mefkure". Arrives at Kibbutz Avuka. 1946 – Leaves the Kibbutz, moves to Natanya and works in construction - where he dreams to paint the walls which he builds. 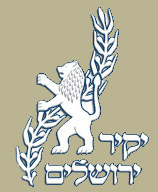 Joins the "Haganah". 1948 – Joins the army and participates in the War of Independence. 1951 – Moves to Jerusalem, fulfills his dream and evening courses in painting in "Betzalel". 1951-1956 – Youth guide in various neighborhoods in Jerusalem. 1952 – Accepted as a full student in "Betzalel" in the Metalwork department. Also studies Sculpting and Enamel. 1956 – Graduates from "Betzalel". Received twice the Sonnenbourne scholarship, and Sonnenbourne award for his graduation piece in Metalwork. The Eternal Flame he deigned during his studies is purchased by "Zim" company for the company's fleet. During his studies was invited to participate in a special course for restoration of Mosaics and Frescos by UNESCO, with Prof. Oeseli director of the Art Academy in Ravena, Italy. 1956-1996 – For 40 years restored mosaics and frescos all around Israel. 1956-1958 – After graduating, travelled to Holland to specialize in the design department of the Royal Design Factory in Zeist. Medba Map for Mr. Meir Weisgal. 1960 – The Weitzman Institute Commissioned a mosaic map of the Israel Tribes in tribute for Otto Preminger. 1965-1967 – Exhibition and study tour in the US, also guided youth at Cejwin Camp at Port Jarvis. Invited to exhibit two of his mosaics at the Smithsonian Institution. 1969 – Sets his permanent Studio at Chutzot Hayotzer near the Jaffa Gate. 1981 – Museums tour in the US and Canada, after receiving the Sidney and Bell Creation award as a scholarship for this trip. 1990 – Elianne Wilson, Anthologist, invites Motke to join her in creating the book: "Jerusalem Reflections of Eternity". 1991 – Invited to exhibit his Jerusalem painting in Frankfurt, Germany, in tribute of Teddy Kollek's 80'th birthday. 1994 – The National Chzeck Television prepares a documentary about Motke called "All Colors White". 2002- Volunteers weekly with mentally disabled artists at AKIM. 2006 – Receives the Ish-Shalom Award for life achievements for his special contribution to art, and for being an ambassador of peace in his paintings. 2007 – Holocaust Museum in Washington commissions a painting for their permanent display. 2008 - The National Chzeck Television prepares a continued documentary about Motke. 2014 - Recived the jerusalem Award. 2005 Great Neck Arts Center. Great Neck, N.Y.
1965 Smithsonian Institution, Washington D.C.
1966 UNESCO Brandeis Intl., Washington D.C.
1966 National Gallery of Design, N.Y.C. All through his fruitful creation years, Motke held over 50 One-Man-Shows all over Israel and the world, including Holland, Chzech Republic, England, Belgium, France, Australia, Austria, New-Zealand and all over the US and Canada. He participated in many group exhibitions around Israel and abroad including South America, Europe, Asia and the US, and also in theme exhibitions and in various techniques including Miniature, sketch and sculpting exhibitions. Many works were commissioned from him for public buildings and VIP's in Israel and around the globe: The Justice Ministry an the Ministry of Tourism commissioned posters which are exhibited till today in the various offices; Mosaics and Tapestries were commissioned by Israeli and Jewish institutes; His Kinetic sculpture was donated to the Hadassah Hospital by Muriel and Philip Berman; Many of his paintings appear on covers of books and on walls of public buildings around the world. All those years he never stopped experiencing with new material, various expression ways and explores the boundaries of creation in all media. He now focuses in experimenting in shape, color and texture both in the classic media and the modern ones. Since he established his studio at Chutzot Hayotzer, Motke opened his gates to schools, kindergartens, and children and adults with special needs without limits. He taught in kindergartens and schools, with people with special needs and the sick, and assisted people to find their special inner strength hidden in them through painting and creating. During the years Motke contributed many of his creations in two levels: for schools, clubs, institutions, the IDF and special organizations; He also contributed his paintings for philanthropic purposes and auctions for funding organizations for the benefit of education and social activity.